I've had four pet rabbits: one in childhood and three in recent years. 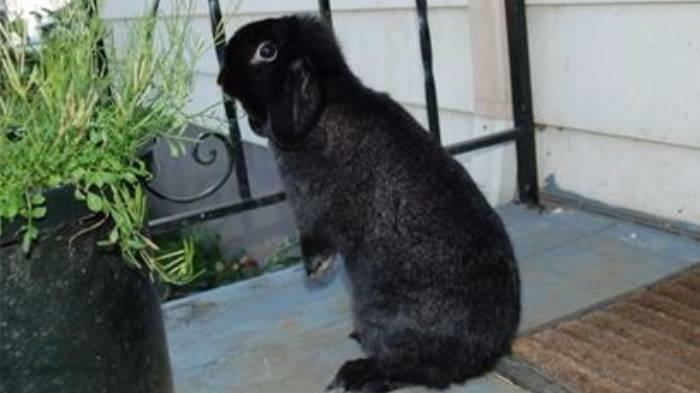 Our lop, Dexter, turned out to be a great pet but only because we let him train us. We adopted Dexter from our local humane society. Only six months old, he had already been rejected. Parents had bought him from a breeder for their child. He must have been adorable as a baby. Then he grew bigger and moodier, especially without neutering. The family kept him in a pen outside, found him unfriendly, and concluded he was not a good pet. Luckily, his owners took him to the shelter rather than turning him loose in a local park to be mauled by dogs or eaten by a hawk. We brought Dexter home to what must have seemed like a palace. He treated it like that for the next six years. We had Dexter neutered, trained him to a litter box, and gave him the run of the house. Then we let him take the lead in connecting with us. I found, with some exceptions, most rabbits don't want to be lap or pocket pets. They're cute, but they're not very cuddly. Rather than picking my rabbits up, I got down on their level and connected at their pace. With Dexter, that meant stretching out on the floor and rubbing the top of his head with my nose. In his first year with us he didn't like hands (think claws) at all. Gradually, he accepted them. In his final year, Dexter sometimes hopped on the couch for his evening slice of apple, forgot where he was and sat for a few minutes for a head scratch. Sometimes, Dexter did not want to be touched. He just wanted to hang out nearby, listening to our voices and enjoying our presence. We learned to appreciate these non-tactile forms of rabbit interaction. After the sudden death an an earlier rabbit my son brought home, we learned the importance of feeding unlimited timothy hay and not overloading a rabbit’s delicate digestion with alfalfa or treats. We found the House Rabbit Society to be an excellent source of information on feeding, health and rabbit behavior.